High-ranking officials from the Department of Justice, Department of Interior and Local Government, and the Department of Science and Technology, signed the Implementing Rules and Regulations of the country’s Cybercrime Prevention Act at the New World Manila Bay Hotel last August 12, 2015. Among the signees were DOJ Secretary Leila de Lima, DOST Secretary Mario G. Montejo, and DILG Undersecretary for Operations Edwin Enrile. Also known as RA 10175, the Cybercrime Prevention Act aims to extend the reach of the law in the digital space. “The imperative of having a legal framework that penalizes cybercrime and its many evolving forms provides for strong international cooperation, given the transnational nature of cybercrime, and lays out an effective implementation strategy anchored on the regime of electronic evidence,” said Secretary Leila M. de Lima. “It is our mandate to ensure that all crimes ought not to go unpunished; that wherever cyber-criminals may be found, the full force of the law must apply.” she added. Representing the outgoing DILG Secretary Mar Roxas was Atty. Edwin Enrile, Undersecretary for Operations who acknowledged the hard work of the composite Technical Working Group that conducted 4 public consultations involving more than 40 organizations and entities. He also assured netizens that their welfare is top priority in the creation of the IRR, “We would like to protect everyone against cybercrime offenses such as illegal access, computer-related forgery, identity theft and fraud, cybersex and online libel.” Undersecretary also expressed the DILG and PNP’s commitment and effective enforcement of the provisions of the Cybercrime Law and its Implementing Rules and Regulations. DOST Secretary Mario G. Montejo stated that as a shepherd of the country’s R&D agenda, the DOST also has the shared responsibility with the DILG and DOJ in keeping cyberspace safe for government, businesses, and the Filipino people may enjoy the benefits that ICT and Internet holds in store. 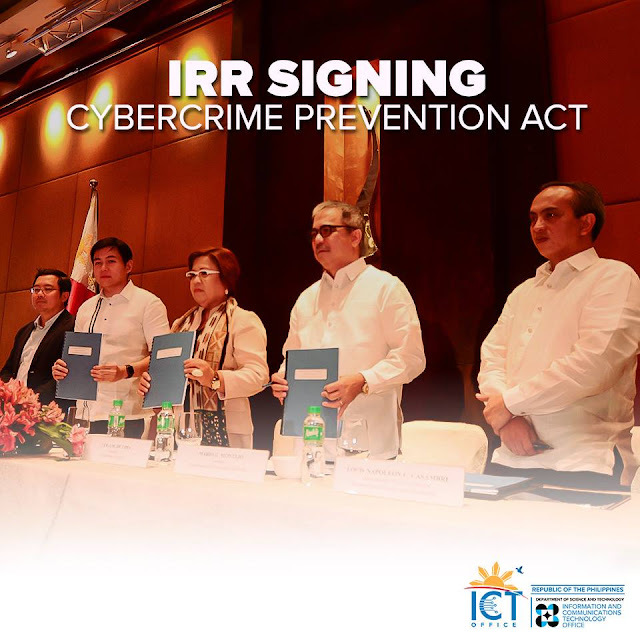 Beginning with the development of the seminal Cybercrime Prevention Act that took 14 years to pass into law, the IRR went through a series of government and public consultations that included stakeholders from business, academe, non-governmental organizations, legal profession, media, ICT groups and internet service providers over a period of 17 months. Secretary De Lima stated that the IRR is a concrete manifestation of perseverance to see that the rule of law extends to cyberspace, and that law enforcement catches up with the emerging changes in technology and those who abuse it. ICTO Executive Director Undersecretary Louis Napoleon C. Casambre and DOJ Office of Cybercrime Head Assistant Secretary Geronimo L. Sy served as focal persons for the crafting and finalization of the IRR.